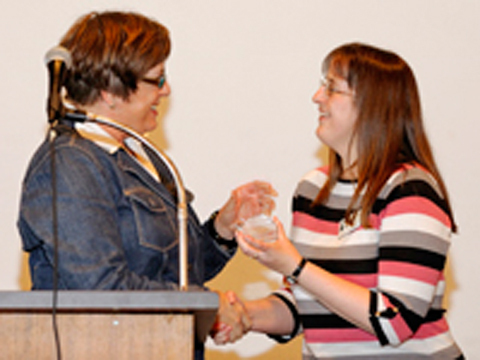 This annual award gives Read Aloud Nebraska an opportunity to acknowledge an individual or group that has made a significant contribution toward our mission of “promoting healthy, successful children and families through reading aloud”. 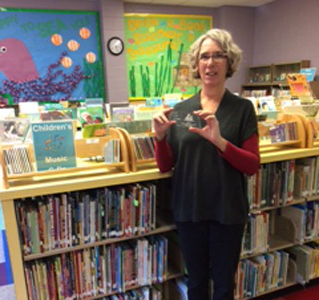 Vicki Wood has lead Lincoln City Libraries in promoting reading aloud with several programs. She works with the City/County Health Department to encourage early literacy among the low income clients they serve by providing children with free books when they come for their immunization appointments, providing books for the clinic waiting room and recruiting and training adult volunteer readers who are available on busy clinic mornings. Over the years, Vicki has worked with various organizations to bring the Read to a Dog program into the Lincoln libraries. This program helps children who may be struggling practice their reading skills in a safe and comfortable environment. Vicki was also instrumental in bringing the Prime Time Family program into Lincoln City Libraries and has participated in training for Prime Time Preschool. Another program she championed was Read 15 Minutes a Day which was adopted by Lincoln City Libraries as a way to educate adults on the importance of reading aloud through special programming, a select collection of books and fun incentives to encourage participation. Read Aloud Norfolk promotes healthy, successful children and families in Norfolk and Northeast Nebraska through reading aloud. The group sponsors the annual Children’s Day Festival, gives Read to Your Bunny books to new parents as they leave the hospital, supports local Prime Time Family Reading Time efforts and distributes approximately 5,000 books each year through the First Book National Book Bank. Nearly 60,000 free, new books have been given to children and families since 2002. The Lincoln Community Playhouse has collaborated with Lincoln City Libraries, particularly the Gere Branch, for many years. A library staff person prepares a book list of adult and youth titles to match each play they perform. The Playhouse publishes the book lists on their website and promotes reading as part of the audience experience. They have also instituted a read aloud time for their Theatre Arts Academy during quiet time at the summer session. Morrie Enders, the director of the Lincoln Community Playhouse, has presented at two Read Aloud Nebraska workshops. 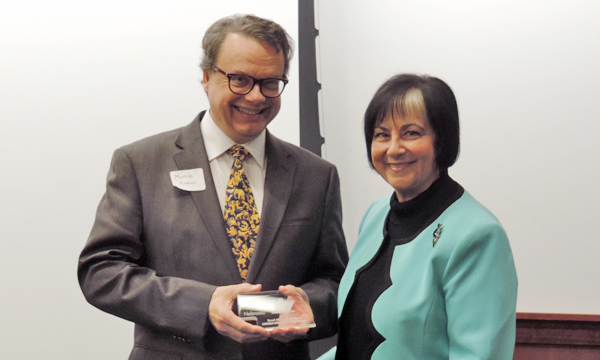 Former First Lady of Nebraska, Sally Ganem, presented Morrie Enders with the Read Aloud Champion award. First Book provides access to new books for children in need by working with programs and schools throughout the US and Canada. 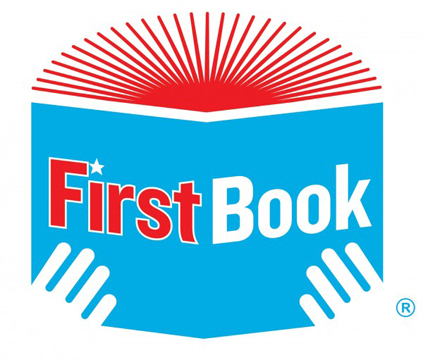 Over 115 million books have been distributed by First Book to date. Read Aloud Nebraska has received many of the books we share with children from low-income families from First Book. We work with our network of schools and community organizations to distribute these books to children who need them the most. Lisa Guenther is a reading teacher in the Norfolk Public Schools who shares her love of reading with children and their families in many exciting ways. Lisa coordinates several Prime Time Family Reading Time programs in the schools and piloted a summer Prime Time program in 2013. She coordinates a program that grew from One School/One Book to Nine Schools/One Book in a few short years. Lisa has shared her program ideas with teachers around the state and some are now being implemented by other schools. She is a valued member of Read Aloud Norfolk! Dr. Tom Osborne has participated in a poster project of the Nebraska State Reading Council – “Go Big REaD”! As a U.S. Congressman he was part of the “Get Caught Reading” campaign. He also participated in a poster project done by Read Aloud Nebraska – “Nebraskans…Proud to Read Aloud.” In addition to these literacy campaigns, Dr. Osborne has participated in many, many school reading programs through the years. He is truly a Nebraska Read Aloud Champion! 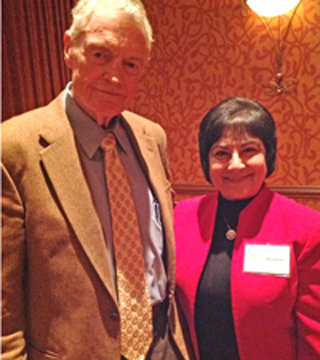 First Lady of Nebraska, Sally Ganem, presented Dr. Tom Osborne with the Read Aloud Champion award before his keynote presentation at the 2012 MPLA/NLA/NEMA Joint Conference. 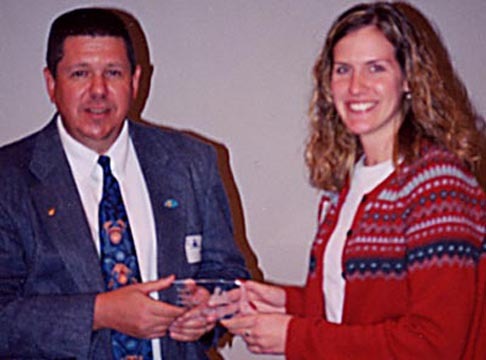 Beth Canuteson, Director of External Affairs, accepted the award on behalf of the AT&T Foundation. Read Aloud Nebraska has received three generous grants of $1,000 each from the AT&T Foundation to fund several projects including the Michael Sullivan and David Biedrzycki workshops. These grants have also helped to purchase books that have been distributed by Read Aloud Schools and Communities to children in need across the state. The Plum Creek Children’s Literacy Festival celebrated its 15th year of bringing children’s authors and illustrators to Southeast Nebraska. Children and teachers have the opportunity to interact and listen to the people who write and illustrate the books they enjoy. Dr. Janell Uffelman had the vision to begin this yearly event which now brings together over 9,000 children and educators over a three day period to celebrate the love of reading. Coordinator Vikki Gremel has help from a committee of educators and community volunteers who work numerous hours to make the event a wonderful experience for all in attendance. 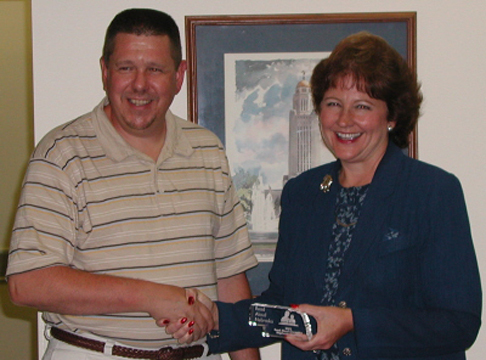 Pat Leach, Director of Lincoln City Libraries, was a member of the Read Aloud Nebraska (RAN) Board for many years. Her enthusiasm and energy helped move the goals of RAN forward. 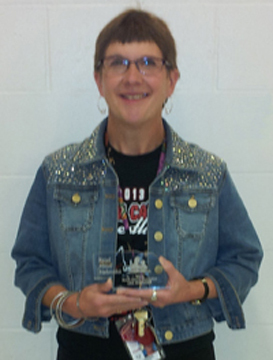 She has volunteered to give presentations on behalf of Read Aloud Nebraska, assisted in various capacities with all of the speaker events Read Aloud Nebraska has sponsored, and served as Secretary for the RAN Board. In addition, Pat has promoted reading aloud to the patrons of Lincoln City Libraries and at every opportunity afforded her. She has always been a Read Aloud Champion. 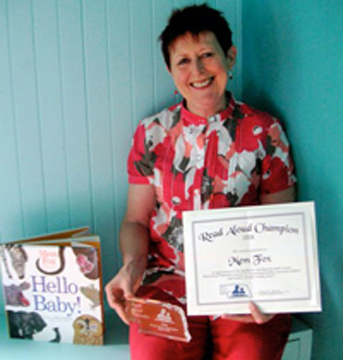 Hear Mem Fox’s enthusiastic reading of three of her books on her web page, then you’ll know why she is a Read Aloud Champion. She shares her insight into the simplicity and success of reading aloud to children in her book Reading Magic and in the presentations she has given in her homeland of Australia as well as the U.S and other countries. Mem advocates for parents (and relatives, friends, acquaintances) to read aloud to children starting at birth, and just three stories a day makes a world of difference. 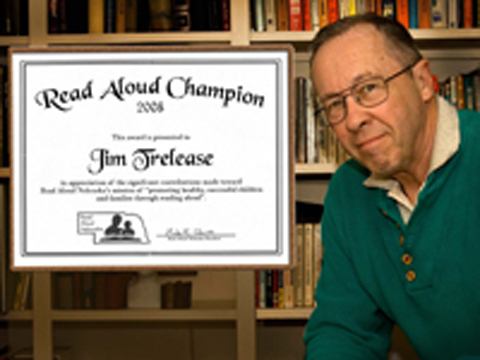 Since The Read Aloud Handbook first hit bookstores, Jim Trelease has been a well-known and respected advocate for the power of reading aloud. His several visits to Nebraska have inspired many participants who continue to share his enthusiasm and commitment to reading aloud. As he states on his home page: “the goal is to help children make books into friends, not enemies.” Jim Trelease is a true Read Aloud Champion. Photography by Keller. Erika Hamilton is a program officer for the Nebraska Humanities Council. Among several other duties, Erika oversees the Prime Time Family Reading Time program. This national program features high-quality storytelling and discussion for families whose children may be at educational risk. Prime Time encourages families to practice reading aloud and talking about books at home. 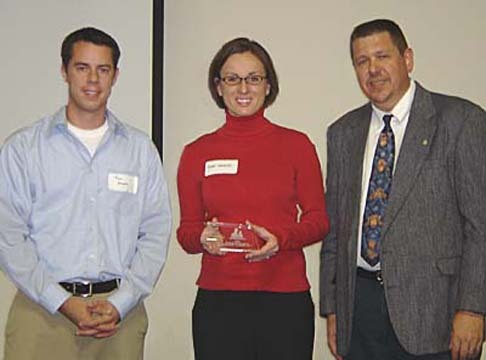 Erika has been a tireless advocate for Prime Time throughout the state of Nebraska, ensuring that Prime Time happens from Scottsbluff to Omaha. Working in concert with libraries and schools, Erika has worked with many people and organizations to enhance family literacy in Nebraska. She exemplifies a Read Aloud Champion. 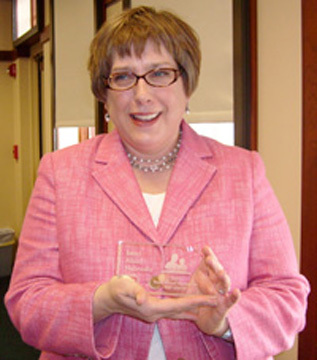 Sharon Weigert has encouraged reading aloud throughout her career. She was an elementary teacher in Wisner and Pender, taught at College of St. Mary’s and was a librarian at the Papillion library. She has been an adjunct faculty member at UNO for the last 6 years. She supervises student teachers and also substitute teaches. She has also been a valuable member of Read Aloud Nebraska, working to help bring both Mem Fox and Frank Serafini to our state. Sharon makes it priority to read aloud almost every day to the students in her classrooms. 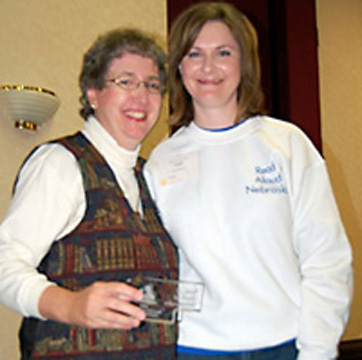 Sharon (left) receives the RAN Champion award. 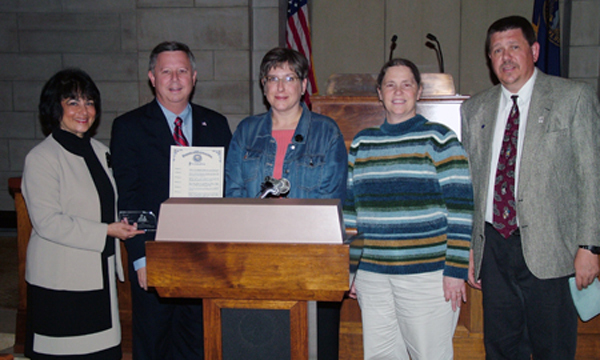 Governor Dave Heineman and First Lady Sally Ganem have been strong advocates for reading aloud to children in Nebraska. Governor Heineman regularly signs our “Read Aloud to a Child Month” proclamation and has shown his support for our “Read Aloud Schools” and “Read Aloud Communities” program. Sally participates as a member of the Read Aloud Nebraska Board of Directors and regularly spends her time traveling around the state to read aloud to school groups. Mark Claussen, a school psychologist with Norfolk Public Schools, has chaired the Read Aloud Nebraska organization since its inception. 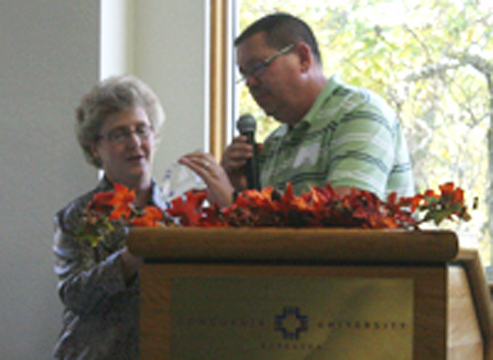 He was instrumental in bringing prominent speakers to Nebraska, including Mem Fox and Jim Trelease. Within Norfolk and throughout the state, Mark has been a hardworking advocate for reading aloud. 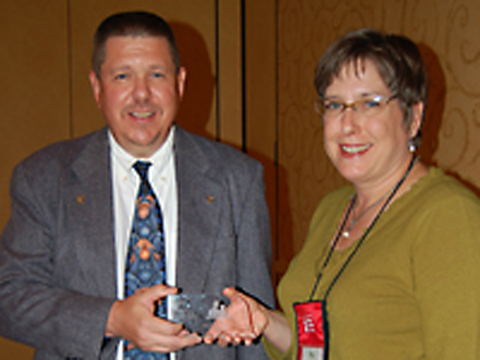 Tim Munn (Creative Services Supervisor) and Renee Sorensen (Promotions/Public Service Director) accepted the award for KOLN/KGIN Channels 10/11, which worked with Read Aloud Nebraska from 2003-2005 to develop two separate public service announcements featuring First Lady Stephanie Johanns. The public service announcements, which were shown statewide, promoted the importance of reading aloud to children as well as the consequences of not doing so. Through its Communications Manager, Becky Richter, Runza Restaurants across the state have been willing to help promote “read aloud” activities in the communities they are a part of. 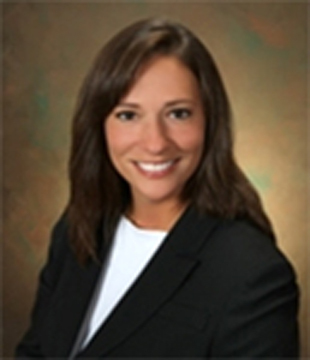 Becky represents Runza Restaurants as a member of our board of directors. 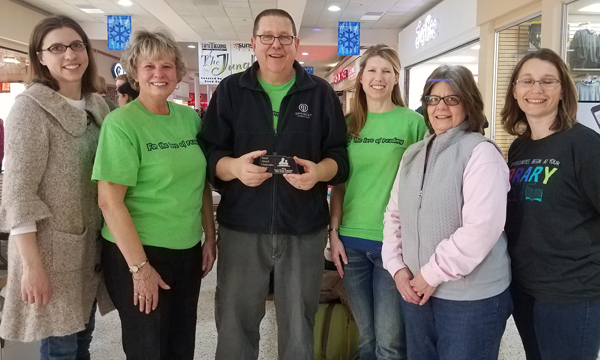 Runza Restaurants has been an active participant in each of Read Aloud Nebraska’s annual programs through the donation of meals to adult and student participants. As Nebraska’s First Lady, Stephanie Johanns has taken advantage of every opportunity to help us promote “reading aloud” to children and frequently participates actively in this activity. She has served as an honorary member of our board of directors and has given her time to help us develop a public service announcement that has appeared in many parts of the state. Read Aloud Nebraska promotes healthy, and successful children and families through reading aloud. Learn more about Read Aloud Nebraska at www.readaloudnebraska.org.